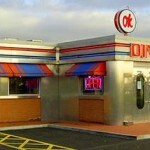 A while ago when driving back from #FCS in 2009 me and @Cadab stopped off at OK Diner on the A1 (Northbound) near Grantham. When there we found out that if you visited every OK Diner in the UK (We say every, there is only 8 in the UK) you get unlimited free drinks for life or something like that. The idea was born and we said that we would visit every single one just to complete the challenge. We have visited 1 or 2 of them before but you have to visit each one and save the receipt from each one and then send it to the OK Diner HQ so we are going to have to start this again and save the receipts. Click here to see the OK Diner map i made on Google Maps. Heres a list of the restraunts and there completion status!